I look at the Schumann Resonance as the Earth’s heartbeat. We are used to viewing our planet as a scrumptious gem of molten and water for humanity to devour at the expense of our Earth’s health and wellbeing. Would we go about things differently if we knew that Earth (Gaia) is a conscious intelligent life form. That is what science is discovering and insiders have come forward to say that have worked with the most advanced forms of technology still hidden from public knowledge. Everything in our multiverse is made of the common element of “energy”. At its core, energy is information in movement. In other words energy, comprised of codes/frequencies (information), oscillates creating vibration. Those vibrations create patterns. As the quantum science world digs deeper it discovers that these vibrational patterns mimic the same geometrical patterns as the platonic solids, torsion fields and spirals. These vibrational patterns are fundamentally replicated and illustrated through out nature in pine cones, sunflowers, snail shells, the formation of galaxies and the list goes on and on. We are seeing the organizational nature of energy (information) played out in vibrational expression, we experience it as form/matter/life. Earth is made of the same stuff everything else is …”energy”. It is a complex collection of vibratory patterns that organizes energy into the form we call “Earth”. It is an alive organism that breathes, evolves and reacts- “Gaia”. Many scientists are beginning to come to the conclusion that the planets and stars are just as alive as you and I, teeming with consciousness/intelligence. (Intelligence as we have discovered is not confined to a brain.) Instead of looking at a planet as a big rock in orbit it is an organism of intelligent consciousness. The Earth is alive and it has its own heartbeat, expansion and contraction (inhale/exhale), and its own energetic fields that create atmosphere and a sophisticated eco system. The Earth vibrates and emits its own vibrational patterns…its own collective frequency. We can measure that frequency scientifically and it is called the Schumann’s Resonance – The Earths Heart Beat. How the Schumann Resonance was Discovered? In reality the Schumann Resonance was discovered far before scientists theorized it. In ancient mystery schools they understood the connection between the earths vibration and pursuing enlightenment. Long ago did they understand the connection of being in harmony with the earth’s natural frequnecy and its life enhancing benefits. “In 1953, Professor W.O. Schumann of the University of Munich was teaching his students about the physics of electricity when they discovered that the Earth’s cavity produces very specific pulsations; the vibrational pulse of planet Earth. Does the Schumann Resonance Change? We have been regularly tracking the Schumann Resonance since the 1960’s and it has been consistent in registering in at 7.83 hz for decades. It is in the last few decades that it has begun to register more out of the ordinary fluctuations and spikes to higher frequencies (as high as 30hz recently), although overall it does settle back to its norm. There has been great debate about the implications of these fluctuations and their possible effects on us and the planet. Here are some good articles and video posts on the subject. What Does the Spike in the Schumanns Resonance Mean? You can check in with these sites daily to see what the Schumann Resonance is registering. This is an example of what you will see on the site. The blue areas with green represent the normal vibration pattern expected of Earth. When the Schumann’s Resonance begins to spike and move beyond the norm you will find the white areas show up on the graph. Although I personally agree with some that this site and its data have been and is subject to tampering, I do find it helpful to refer to and ultimately you should use your own discernment. This article highlights some of the strange disturbances in the sites data. This is a complicated subject. In order to understand the effects of the Schumann Resonance on us you need to understand the concept of RESONANCE and ENTRAINMENT. Simply said one vibrational frequency can harmonize with another! In other words one vibrational frequency can tune the other, train it into harmony! Humans are Tuned to the Resonate Vibration of Earth. 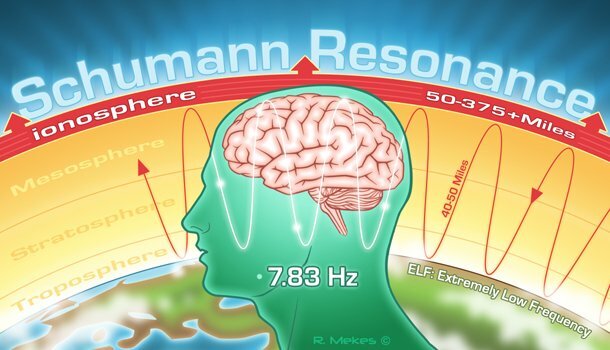 Human beings vibrate, (yes that means you) and the frequency they emit ranges from 5-10hz. We are in the same range as the 7.83hz of the earth. I bet if the studies conducted dug just a little deeper they would have found people emitting a frequency closer to 7.83 were more at peace and healthier. We are designed to be in harmony – “Coherence” with the Earth’s vibration and when we are we flourish. When we are Incoherent with that vibration we suffer. If we are out of sync with Earth’s Frequency (Schumann Resonance) we begin to exhibit signs of discomfort that can range from anxiety, insomnia, illness, suppressed immune etc… Conversely we have discovered that when we humans are in sync with 7.83 the body is able to heal and increase its vitality. Thus why it feels so good to be in nature!! Hainsworth concluded that the frequencies of human brain-waves evolved in response to these signals. If his hypothesis is correct, conditions for evolutionary changes in human brain-wave patterns have now been established. Furthermore, variations in these patterns can produce mild to disastrous health and behavioral changes. It is easy to become Incoherent with Earth’s natural vibration (Schumann Resonance) when our world is riddled with so many technological devices (tv, cell phones, computers, cell phone towers, etc.) that emit electromagnetic fields (EMF) that are not coherent with 7.83. We are bombarded and immersed daily in vibrations that interfere with our natural resonance in tune with the planet. Eating processed foods, living with illness, taking synthetic drugs, engaging in stressful situations all contribute to lowering our personal frequency and keep us out of sync with Earth’s vibration which further keep us from experiencing health and happiness and our truest potential. Fortunately, there are a few things you can do to improve your coherent relationship with the Schumann Resonance. Incorporating these things into your life will help you gain the benefit of the positive effects of being in harmony with the Earth’s heartbeat. The simple act of enjoying and being in Nature acts like a tuning fork entraining your vibration into coherence. Any nature spot will do – walk in your bare feet, take a nap on the grass, breathe some fresh air! Use this link to play in the background this simple powerful frequency. Your body, mind and soul will entrain and sync you back into your natural vibration. Listen now! Check the sites linked above if you seem to be experiencing unexplainable agitation, anxiety or sleeplessness. Pay attention to whether the Schumann Resonance has spiked or is settled in its normal vibration. I have often found a correlation. There are several devices that emit a 7.83hz frequency on the market available for purchase. I suggest this as a last ditch effort to combat illness or living in an environment with little to no nature to immerse yourself in. I can not recommend a particular device and post this link to one in Amazon so you have an idea of what your looking for but encourage you to research any unit you are interested in purchasing thoroughly.